Love the touches of red? 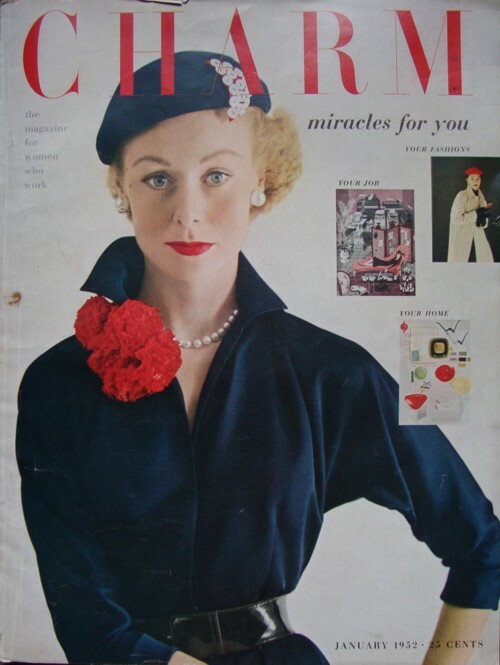 So must have the editor at Charm, as in three January issues, 1951, 1952 and 1954, the model is wearing or holding a bunch of red flowers. Intentional? Who knows. Effective? Definitely! This makes a very attractive cover…with no less than 9 spots of red in just the right spots. While searching the cover for red spots, I noticed the magazine price of 25 cents. Also noticed the itty bitty teeny tiny waist the model has. As usual, Lizzie…I appreciated your example of vintage days long gone (including my own tiny waistline which is also gone, along with the past)… smile. I love the little red crescent on the hat, decorated with white buttons. Clever. How grown-up this model looks! She may actually be over 16…. I notice that Charm is “the magazine for women who work” — in 1952. Also interesting! Well spotted. Maybe red was chosen as a bright cheery color without being overtly summery? Gorgeous! The red ties in beautifully with the title.